Before she can lay her eggs, the female robin, with help from her mate, builds a nest from twigs, mud and dried grass. Nest-building takes the robins two to six days. The entire process, from constructing the nest to new robins hatching, may take between 17 and 27 days. A pair of robins will often nest two or three times in a season, starting the process from scratch by building a new nest each time. 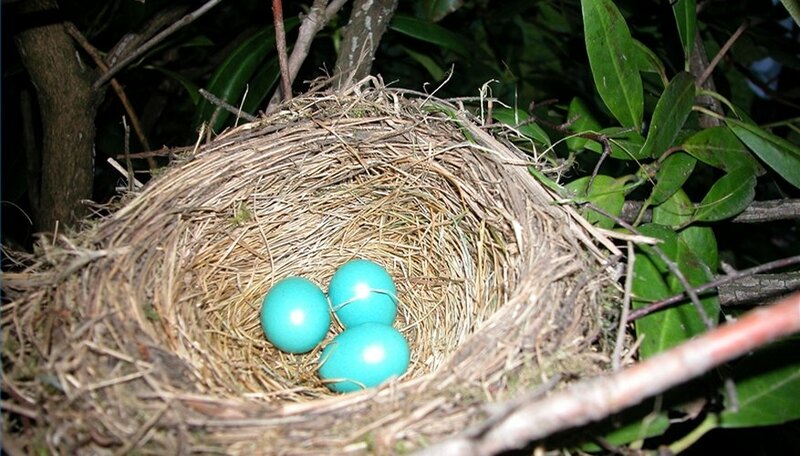 The mother robin must keep the eggs at a healthy temperature to ensure that the embryos develop normally. A robin's body temperature is approximately 104 degrees and is kept steady by the insulating property of feathers. For the eggs to receive body heat more directly, the mother robin develops a brood patch. This is an area on her belly where the feathers have fallen out, exposing the naked skin. In cool weather, the mother presses the brood patch against the eggs to warm them with her body heat. In hot weather, the female will keep the brood patch covered by the long, outer feathers, lessening the degree of warmth the eggs receive. She may even shade the eggs with her wings to keep them cool. During the incubation period, the female regularly moves the eggs around the nest. To do this, she stands on the rim and turns the eggs with her bill. Rotating the eggs helps maintain an even temperature and keeps the embryos from becoming to stuck to the eggshell. After 12 to 16 days, the eggs are ready to hatch, usually one each day in the order they were laid. Like most birds, the chicks use an egg tooth – a sharp hook at the end of the beak – to poke a hole in the shell. The process of hatching can take an entire day, as the chick must rest periodically from the exhausting struggle to free itself of the shell. Newly hatched robins are naked and blind, weighing less than a quarter. The nestlings are fed up to 40 times a day by both parents. At approximately 13 days old, they are ready to leave the nest. More than half of all robins do not survive their first year, destroyed by predators that include the domestic cat. Those birds that do survive will be ready to raise their own young the following spring and are likely to live another five to six years. Maxwell, Clara. "How Long Does it Take for Robin Eggs to Hatch?" Sciencing, https://sciencing.com/long-robin-eggs-hatch-5419182.html. 13 March 2018.